In November of 1998, beloved Jersey rock impresario and manager Bob Benjamin rented out a small restaurant in Red Bank, New Jersey for his 40th birthday. Benjamin had recently been diagnosed with Parkinson's disease, a degenerative disorder of the central nervous system, and instead of gifts he asked that donations be made to the Parkinson's Disease Foundation. Over $2,000 was raised that night. 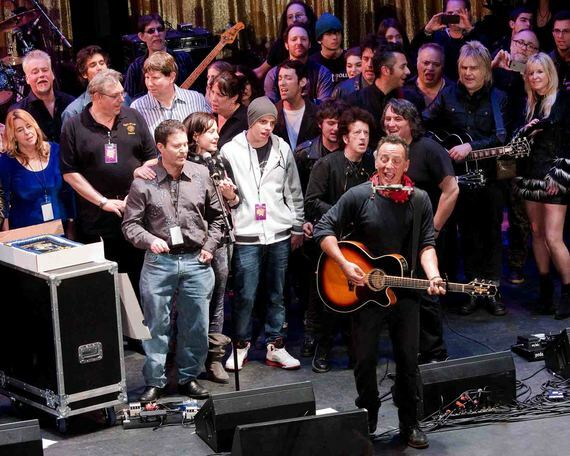 Spurred by the generosity and support of those who attended that party, Benjamin reached out to friends, including concert promoter Tony Pallagrosi and musician Joe D'Urso, and formed the Light of Day charity, taking its name from a Bruce Springsteen song. This year, which is the fifteenth since the foundation was established, Light of Day has expanded to become a multi-genre, multi-venue, multi-continent extravaganza, which spans ten days in the New York-New Jersey area alone annually. There are currently approximately seventy shows in thirteen countries on three continents including the United States, Canada and Australia. I asked Bob if he ever thought his birthday party in Red Bank would grow into anything remotely as big as Light of Day now is. "Not in my wildest dreams," he responded. "What I started as a small birthday party grew into a small multi-act concert then into a week-long international festival and international tour." In the New Jersey/New York metropolitan area alone, the one-day event now spans a total of ten days. Even more significantly, Light of Day has expanded into an internationally recognized annual tour, utilizing a grassroots network of musicians, music fans, and benefactors. The Light of Day shows this go-round included six shows in Canada, an eighteen-day November/December European tour, and a brand new Australian Light of Day event. This year's New York/New Jersey stretch of Light of Day began on Friday, January 9th and continues through Sunday, January 18th. Sunday January 11th featured Steve Conte, James Maddock, Willie Nile, Garland Jeffreys, and Joe D'Urso at Montclair's Outpost in the Burbs as well as a reunion of the popular Jersey Shore band Cats on a Smooth Surface at the storied Stone Pony in Asbury Park. Events run throughout the week in both Manhattan and New Jersey (Wednesday night January 14th features Suzanne Vega at New York City's Cutting Room along with a host of other acts) culminating in what is known as "the main event" on Saturday January 17th at Asbury Park's Paramount Theater. Sold out for months, the headliner at the Paramount on Saturday is LaBamba's Big Band and Friends featuring special guests Southside Johnny and Gary U.S. Bonds along with an all-star lineup which includes, to name a few, Joe Grushecky and the Houserockers, Willie Nile, Pat DiNizio of the Smithereens, Garland Jeffreys, John Eddie, Joe D'Urso and Stone Caravan, the James Maddock Band, Sam Llanas (formerly of the Bodeans), and Dawg Whistle (with former E Street Band drummer and member of the Rock and Roll Hall of Fame Vini Lopez and Asbury legend Paul Whistler). Other events this week feature a country music night paying tribute to Patsy Cline and Johnny Cash, acoustic concerts, a Rock & Bowl-a-thon at Asbury Lanes with Sopranos actor Vinnie Pastore as well as Mike Rocket, Joe D'Urso, Killer Joe, and the James Maddock Band, a Blue Hawks Records Showcase at Asbury's Langosta Lounge, a kids event, and an Anything Anything night hosted by popular radio host DJ Rich Russo on Friday January 16th featuring Wesley Stace (John Wesley Harding). Benjamin is hopeful that this years' events will raise upwards of $600,000. "That would bring us to a total of over $3 million dollars since our 1998 start," he said. The foundation's main function, not just during the events, but throughout the year, is, in Bob's words, "to raise awareness of Parkinson's disease and to fund research to find improved treatments and the ultimate goal: A cure." If logistics prevent people from attending the events in person, what can they do to support the good work of Light of Day? "They can visit our website and click on the donate button or mail a check to Light of Day Foundation at 201 S. 2nd Ave. #22, Highland Park, NJ 08904." What does Bob hope would be the takeaway for people with regard to the work that Light of Day does to raise money for both a cure and quality of life for those suffering from Parkinson's disease? "That Parkinson's is not just a disease of the elderly. You can have Parkinson's and keep on rockin' for many years." That's certainly the case with Bob himself, who has been joined onstage at the main event many times by Bruce Springsteen, whose support for the work of Light of Day is well known. Other past performers besides Springsteen have included Michael J. Fox, Jesse Malin, Alejandro Escovedo, Jakob Dylan, Lucinda Williams, Badly Drawn Boy, Pete Yorn, Mike Peters, Rob Dye, and countless others. As the song's chorus goes, aptly, "Well I'm a little down under, but I'm feeling okay - I got a little lost along the way - I'm just around the corner to the light of day, just around the corner to the light of day" © Bruce Springsteen.